The following obituary was taken from the Beckley Post Herald dated, April 9, 1972. Funeral services for Homer Stokes Gwinn 47, of Meadow Creek will be held at 2 p.m. Tuesday at the Ronald Meadows Funeral Home in Hinton with the Rev. C. H. Martin officiating. Burial will follow in the Meadow Creek Cemetery. Gwinn died at his home early Saturday morning after a long illness. He was born Feb. 24, 1925, the son of the late William Abraham and Fannie Alice Richmond Gwinn. 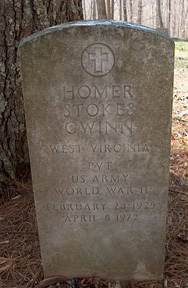 He lived all of his life in Summers County and was a member of the Baptist church and a World War II veteran. He received a disability retirement from the Chesepeake and Ohio Railway Co. Survivors include his wife Jean Weaver Gwinn; two sons, Homer Jr. and Howard, both of Meadow Creek; a daughter, Mrs. Darrell Rucker, Sandstone; five brothers, William of Bridgeport, Ohio, Virgil of Beckley, Herbert of Lakeland, Fla, Donald of Meadow Creek, and Clinton of Barboursville; six sisters, Mrs. Phyllis Hally, Springfield, Mo., Mrs. Edna Gower and Mrs. Vera Cole, both of Montgomery, Mrs. Louise Bailey, Meadow Creek, Mrs. Opal Morrison, Huntington, and Miss Hazel Gwinn, Hazlet, N.J., and a grandchild. Friends may call at the funeral home after 2 p.m. Monday.